The Senate last June passed, on a 68-to-32 bipartisan vote, a comprehensive bill to overhaul the nation’s immigration law. But attention to the issue got shoved aside by the drawn-out fight over the budget and the debt-ceiling, and proponents now face the challenge of getting the Republican-controlled House to take up the legislation. With that challenge in mind, “an unusual coalition of business executives, prominent conservatives and evangelical leaders” has come together to lobby 80 GOP lawmakers from 40 states, according to the New York Times. The push to get conservative Republicans on board could reveal some of the same divides that were evident in the party during the just-ended fiscal standoff. 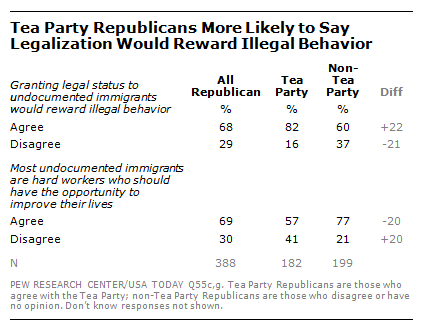 For instance, Republicans who agree with the Tea Party overwhelmingly say that granting undocumented immigrants legal status rewards illegal behavior (82% agree, 16% disagree), according to a Pew Research Center poll conducted in June. That compares with a narrower majority of Republicans who do not agree with the Tea Party (60% agree, 37% disagree). The survey also found that a smaller majority of Tea Party Republicans (57%) than non-Tea Party Republicans (77%) say that most undocumented immigrants are hard workers who should have the opportunity to stay in this country and improve their lives. Conservative Republicans in general are also less supportive than moderates and liberals in the party to support a way for undocumented immigrants to stay legally, something that is included in the Senate bill. Overall, 61% of Republicans say there should be a path to legal status, but there’s a 17 percentage point gap between conservative Republicans (54%) and moderate-to-liberal Republicans (71%). (In Pew Research’s June sample, conservative Republicans outnumbered moderates and liberals by 68% to 31%). The gap between conservatives and moderate/liberal Republicans carries over to the question of which should come first: allowing undocumented immigrants to apply for legal status while improvements are made in securing the border or doing so only after the border is effectively controlled. More than six-in-ten (62%) conservative Republicans say increased border security should come first, compared to 47% of moderate/liberal Republicans. See our Key Data Points fact sheet on immigration.